GENEVA, Switzerland, March 7, 2013 (ENS) – Like a prima donna, Ferrari’s ultra-powerful new hybrid, LaFerrari, made a star’s entrance at the Geneva International Motor Show at its public opening today. Ferrari joins other makers of elite supercar hybrids in Geneva – the McLaren P1 and the Porsche 918 Spyder – in a three-way race for the world’s fastest, most fuel-efficient plug-in hybrid. The price of two of these limited edition hybrid super sports cars is reported to be north of US$1 million, while the Porsche is priced at $845,000. Only 499 of the LaFerrari premium hybrids will be built in a limited-series special offering and all 499 are already spoken for. “Aimed at our collectors, this is a truly extraordinary car which encompasses advanced solutions that, in the future, will find their way onto the rest of the range, and it represents the benchmark for the entire automotive industry,” said di Montezemolo. 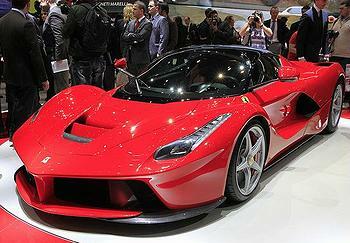 The fastest-ever Ferrari built for the road, LaFerrari runs on a 789-horsepower, 6.3-liter V-12 gasoline engine together with a pair of electric motors – one to power the wheels and a second to power the car’s accessories. The hybrid system propels LaFerrari from zero to 62 miles per hour in fewer than three seconds and to 124 mph in under seven seconds. LaFerrari hits its top speed at 217 mph. A lithium-ion battery pack gathers spare energy from the four sets of carbon ceramic brakes. The entire carbon fiber chassis is handmade for lightweight strength. The Italian automaker is proud of the low emissions standard achieved for the LaFerrari – although at 330 grams of CO2 emitted per kilometer the emissions still are way higher than the current European standard for family passenger cars – just 1.0 g/km. McLaren Automotive, the British manufacturer of luxury sports cars, displayed its first high-performance hybrid Tuesday at the Geneva Motor Show. McLaren claims the P1 will be the world’s fastest street-legal track car and say its “technological and spiritual inspiration” comes from the company’s racing division. Since 1963, McLaren Racing has been one of the most successful teams in Grand Prix motor racing with some of the most iconic Formula 1 cars. 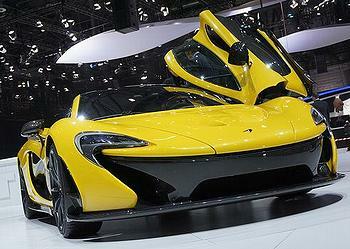 The McLaren P1 hybrid was previewed as a design study at the 2012 Paris Motor Show. Now, the production-ready car is making its world debut in Geneva. McLaren says the P1 will deliver a peak output of 903 horsepower, while emitting less than 200 g/km CO2. Of course, emissions are zero in full electric drive mode. The engine block in the McLaren P1 is cast to incorporate the McLaren-designed 176 horsepower electric motor with the 3.8-liter twin-turbo V8 gasoline engine. The battery is mounted onto the underbody of the high-strength Formula 1-grade carbon fiber chassis, avoiding the added weight of battery packaging. McLaren prides itself on being a pioneer in the use of carbon fiber, which is seen throughout the P1. All power from the electric motor and the gas engine is channeled through the P1’s dual-clutch seven-speed gearbox to drive the rear wheels, and the battery recovers braking energy. The Formula 1-derived Instant Power Assist System allows the P1 driver to deliver a power zap from the electric motor to the drive train. The Porsche 918 Spyder on view in Geneva this year has completed more than half of its development time since it was first shown as a concept car at the 2010 Geneva Motor Show. This plug-in hybrid super sports car combines a high-performance combustion engine with two electric motors to go from zero to 60 mph in less than three seconds. The car hits its top speed at 202 miles per hour. The German automaker says the 918 Spyder performs like a race car, developing more than 770 horsepower, while consuming less than a gallon of gas per 100 kilometers (60 miles), better fuel efficiency than that of most modern compact cars. The three power units are controlled by what Porsche calls “an intelligent management system” that uses five pre-selectable modes. When the vehicle is started, “E-Power” is the default operating mode as long as the battery is charged up. In ideal conditions, the 918 Spyder can cover more than 25 kilometers (15.5 miles) on purely electric power. In this mode, the combustion engine is only used when needed. If the battery charge falls below a set minimum value, the car switches to hybrid mode. In “hybrid” mode, the electric motors and combustion engine work together for maximum efficiency and minimum fuel consumption, the best mode for city traffic. In more dynamic situations, the 918 Spyder selects the “Sport Hybrid” mode for its motors. The gas engine provides the main propulsion, while the electric motors provide an electric boost when the driver demands higher output, or for greater efficiency. This mode is for high performance and a sporty driving style. “Race Hybrid” is the mode for the highest possible performance. The combustion engine is under high load and charges the battery when the driver is not utilizing the maximum output. The electric motors provide a boost when the driver requires even more power. 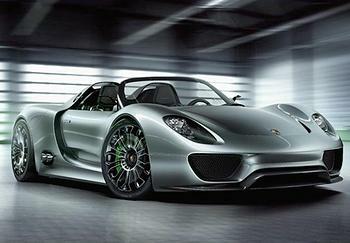 Porsche has officially confirmed the 918 Spyder’s starting price at $845,000 in the United States. These speedy plug-in hybrids are on view at the Geneva Motor Show, which opened to the public today and runs through March 17 at the Palexpo Congress Centre.